This week, MTA introduced Grow Like A Lion, a new grade-wide initiative for Sophomores. The goal of this program is to help talmidim develop their emunah and recognize Hashem as our Creator. Sophomores gathered in the library on Tuesday morning to learn about the program. Grade Dean Rabbi Elon Soniker began by explaining how everything that happens in life can either be dismissed as a natural coincidence or appreciated as the miracle that it is. He discussed the example of how the miracles in Egypt during yitzias mitzrayim were dismissed by the Egyptians, and even by doubters in modern times, as natural events, despite how incredible they were and how you have to look for the miracles in everyday life to truly understand Hashem’s existence. 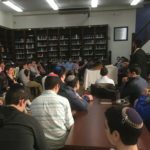 Associate Principal Rabbi Shimon Shenker then went on to introduce the new program. He described how “Grow Like a Lion” will encourage talmidim to increase their emunah and bitachon in Hashem. Once a month, 10th Grade talmidim will have a choice of three specific activities that increase emunah and recognition of a Creator. The three activities will revolve around a particular theme and goal that talmidim will contemplate. At the beginning of each month, the theme and activities will be introduced and talmidim will choose which of the three activities they will work on. Their choice will be recorded in a Google Doc, which will not be shared with their rebbe or the administration, where they can track their progress. Once a week, each 10th Grade rebbe will have the talmidim in their shiur access the Google Doc and rate themselves on their performance of the activity. The rebbe will then moderate a group conversation about the activities and encourage talmidim to discuss their challenges and open up about their feelings towards emunah. In addition to the tracking system, there will also be three yomei iyun with Torah personalities who will lead presentations on inyanei emunah followed by breakout sessions, where the entire grade will be divided into small groups led by the rebbeim, administration, and guidance staff. Sophomores are excited to get started on this month’s goal, which is to think about Hashem every day. Talmidim look forward to tracking their progress and further developing their emunah in Hashem.